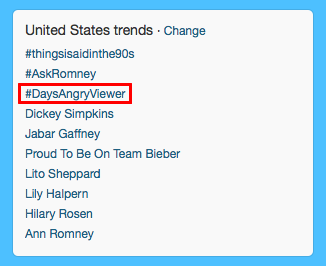 Congrats to everyone who participated in the tweetfest to get #DaysAngryViewer trending in the US and worldwide! Keep it up! Going again tomorrow at 4:30 est! Thank you! I'll be there. I am so tired of Matt Ashford being fired every time someone blinks. As a Jack fan, I feel like I've been kicked around too many times, and I don't want Jack exiting without a fight. I'll be there again today. I hope I didn't hurt the campaign.